Join us for a full day of holistic self-care for women! This will be a hands on workshop where we will explore the pelvic bowl, our womb spaces and our breasts from a whole new perspective! You will go home with practical and powerful self-care practices to support vibrant reproductive health! This is for adult women of all phases, and is truly wonderful support for pregnancy and the postpartum. No experience required! - An intro to holistic breast & pelvic bowl care for vibrant health - learn what this work is all about! We will also be hosting a small pop up clinic after the workshop! Both myself, and Sasha will be offering four 1 on 1 body work sessions from 6-8pm, at a discounted rate for women attending the full day workshop. I will be offering lymphatic breast massage/ breast checks and education around your the health of your individual breast tissue and for the half-hour session with Sasha, women have the option of receiving external pelvic adjustments, energy work, or learning self-internal pelvic massage and basic self-exam. Spaces are limited for these body work sessions, and pre-registration is required! 5-6pm Stay and invite your friends to join us for an Open House to meet the practitioners, find out more about this work, and connect with like-minded women. Tea and snacks will be served. WombMovement is a fitness class for the feminine body, mind and spirit. The class weaves pilates, yoga, breathwork, meditation, vocalization and affirmation with the intention to strengthen the muscles of the pelvic floor, enhance the flow of feminine energy, and deepen our connection to our bodies and our womb wisdom. This gentle yet powerful class guides women into presence with their physical body and womb. Self expression and emotional release are welcome as we reinhabit our physical and energetic space as women. Modifications are offered to meet each student’s needs and abilities. Pelvic floor and core strengthening and cultivating feminine essence benefit women of all ages and life stages. Holistic Pelvic Care (HPC) combines fascial release, herbalism, and energy work to evaluate, restore balance, and enhance vibrant flow in the pelvic bowl of the female body by shifting a woman’s core muscular and energetic patterns. Holistic Pelvic Care helps to relieve and heal pelvic pain, muscle imbalances, physical and emotional trauma, birth disruptions, energetic blocks, and release stored energies. HPC empowers women to fully inhabit their body, teaches pelvic self-care, increases energy flow, blood flow, and sensation in the pelvis, helps women to access the creative potential in our wombs, and provides resources for women on their path in all stages of life. 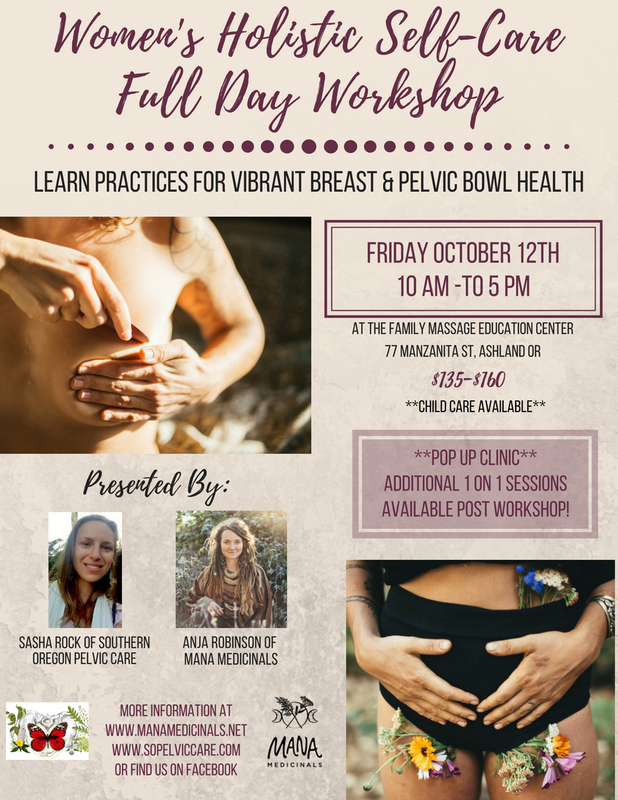 Join Sasha Rock, founder of SO Pelvic Care, for a detailed introduction to Holistic Pelvic Care (HPC) for Women. In this 2-hour class, you will learn how HPC fills the gaps in women’s healthcare left by the standard allopathic care system by providing holistic resources for all stages of a woman’s lifecycle. The class will cover the physical and energetic anatomy of the pelvic bowl, including how each of our reproductive organs correlates to a specific stage of the creative process, and how we can use this wisdom to align with our energetic cycles to support us in childbearing, mothering, and ALL of our creations. We will touch on some specific remedies for common imbalances that can occur throughout a woman’s lifecycle. Sasha will teach self-care tools and resources for holistically supporting your pelvic wellness, including herbal medicine for female health, self-assessment and self-massage. We will also include a short pelvic bowl meditation, guiding you into deeper connection with your sacred womb space. Self-care is a revolutionary act. As women, it is time we reclaim our health and our bodies. It is time we listen deeply. It is time we become intimate with our own physiology so that we may experience the fullest expression of our vitality. It is time we become embodied and empowered. It is time for radical self care and self love. The act of creating daily ritual is the most precious gift we can give ourselves. It is an act of deep self- love, one that ripples through all facets of our lives. It nourishes the physical, mental and spiritual while at the same time opening an intimate dialogue with our bodies. Explore Lymphatic Breast Health though the lens of Ayurvedic Self-Care. We will dive into our inner landscape and begin to understand the importance the lymphatic system plays in self-care and immunity as well as teach some tools to help support lymph flow and blood circulation. We will discuss anatomy and physiology, common health concerns for women as well as contributing lifestyle factors. Together we will come up with creative solutions to our blockages around self- care as well as mind-body medicine techniques to infuse into our daily practice. We will learn how to map the terrain of our breast tissue and holistically care for our breast health. Experience the juiciness that is inspired self-care and empowered women’s health! Sasha Rock has studied & practiced healing arts for 10 years. Sasha is a clinical herbalist, Reiki master, has studied with energy body expert and renowned author Cindy Dale, and is a skilled, knowledgeable bodyworker. Sasha feels honored to be fulfilling her purpose helping women heal and empower their feminine body. She holds a nurturing, safe and tuned-in space for clients to embody their whole selves. Anja Robinson is founder of Mana Medicinals, a small holistic health company focused around women’s health, nutrition and empowerment. She is a Clinical Herbalist, Holistic Nutrition Consultant, Integrative Woman’s Health Educator and Birth Doula. Anja is passionate about women’s health and believes that it is every woman’s birthright to have access to a healthy lifestyle in sync with the body’s natural rhythms. She believes in the body’s innate capacity for healing and a woman’s own intuition around her well-being. She helps empower women to take back their health through body literacy, syncing with their natural cycles, hormone and blood sugar regulation as well as holistic nutrition education and body-mind-spirit medicine techniques. She believes that healing is elemental, and through exploring the ways in which the elements are expressed in each woman’s individual constitution, insight is gained into the pathways towards optimal health. She is passionate about whole foods nutrition, botanical medicine and sustainability; for bodies and lifestyles, as well as for the Earth. Anja’s apothecary, women's wellness mentorships and classes represent a compassionate system of healing that weaves together traditional western herbalism, holistic nutrition, functional medicine and the wisdom of Ayurveda to help women, families and communities lead healthy, vibrant lives in harmony with our sacred ecosystems. This is going to be an amazing day full of hands on learning, connection and self-care! This work is so important to us as women, and I hope you will join us!